Congratulations. You've found the most technologically advanced portable fuel-fired heater on the market today... the amazing VAL6. 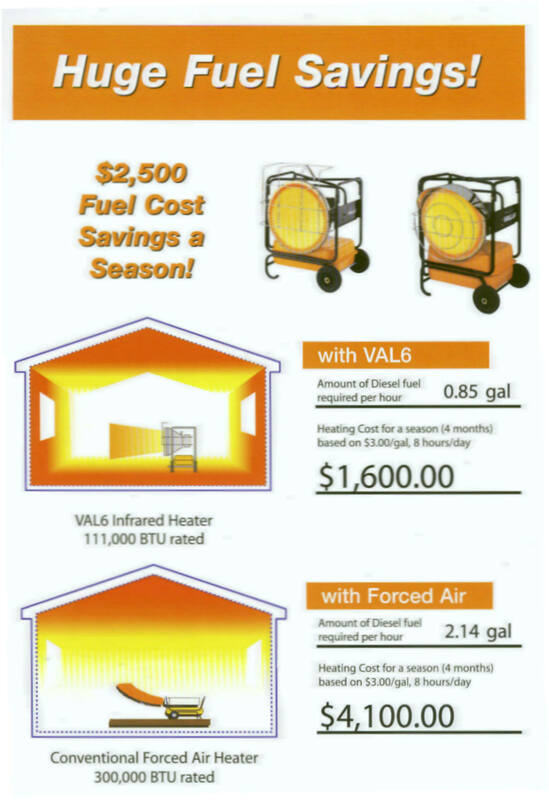 Unlike forced air heaters, the VAL6 has big advantages. Read on to discover what the VAL6 can do for you. 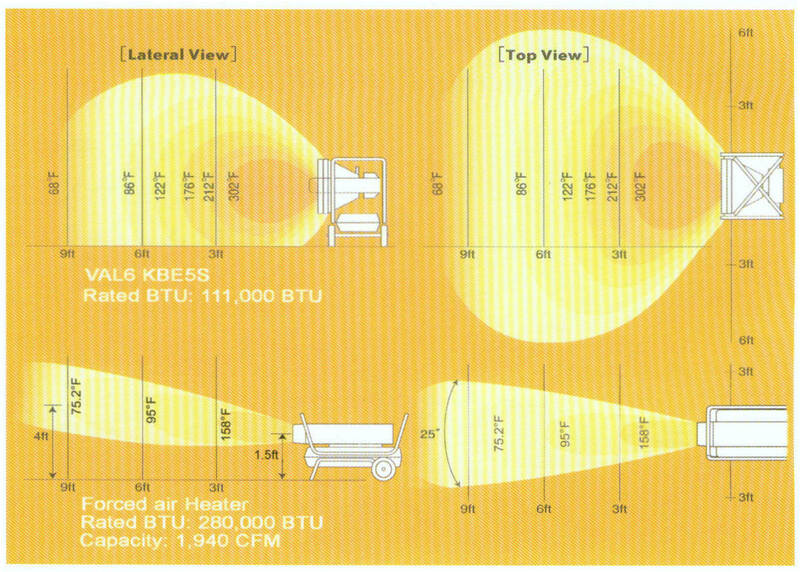 As shown above, the VAL6 uses about 1/3 the fuel compared to a conventional forced air heater, dramatically reducing operational costs and nuisance tank refills. But that's all. The VAL6 can also heat up to 3 times the area compared to forced air! Get the picture? The VAL6 is an infrared radiant heater that spreads its sun-like energy much more effectively to penetrate objects. Once they absorb that energy, those objects re-radiate heat to warm surrounding air and adjacent spaces. By contrast, the forced air convection heater wastes heat at the ceiling and simply cannot warm people and objects as effectively or economically. 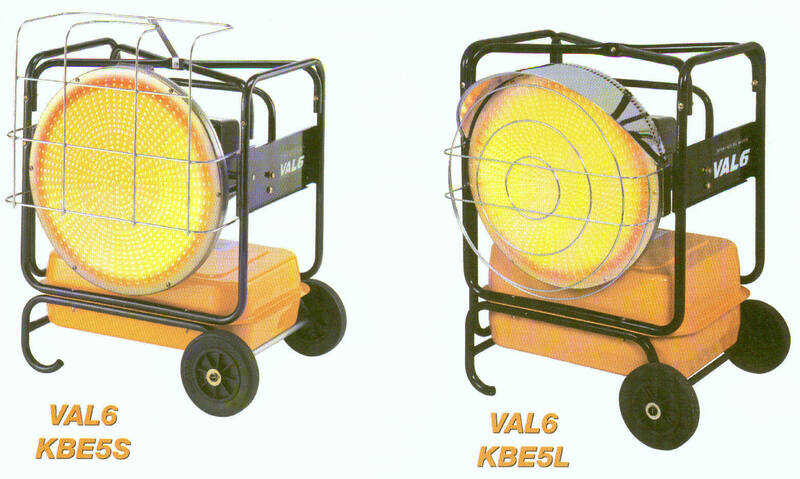 And unlike forced air heaters, the VAL6 is uninhibited by wind and other adverse weather conditions, making it a popular choice for brick layers, stucco workers, concrete workers, and other outdoor construction trades. That resistance to wind also makes the VAL6 an excellent heater for outdoor recreation and sporting events. What other benefits does the VAL6 offer? The VAL6 creates a more comfortable working environment. By contrast, convection forced air heaters are notorious for producing unpleasant odors, excessive water vapor, disturbing noise levels, and irritation from smoke and dust, not to mention up to 30 times more carbon monoxide, which can exceed National Indoor Air Quality guidelines of no more than 15 ppm for an average of 8 hours operation. The VAL6? ... only 1 to 2 ppm on #2 diesel fuel! That's a clean burning heater! How can the VAL6 combust fuel so efficiently? The VAL6 utilizes an optimally designed chamber that creates a near perfect fuel/air mixture through perfect atomization and enabling the temperature to reach 1800 degrees F. Heat absorbed by the radiation disk can reach 1500 degrees F to radiate sun-like heat in a uniquely wide pattern at very high output. Starting up the VAL6 is just a flip of a switch. The heater reaches peak capacity in 1 to 2 mintues. This means lower cost of operation, far superior directional control of heat, far less combustion by-products, less irritants, virtually odorless operation, greater comfort, quieter operation, longer operation with fewer refills, instant heat, more effective outdoor use and a much safer, cleaner burn. Note: In addition to a larger capacity 15.1 gallon tank, the new KEB5L model has a top deflector (see photo). This feature provides better directional control of heat and helps protect the burner from debris or elements from hitting the heater face.